Meet SHOSH, creator, manager and musical force behind 24hr Garage Girls. American born DJ/Producer & Promoter, Shosh has quickly risen as an emerging talent in the UK Garage & Bassline underground. 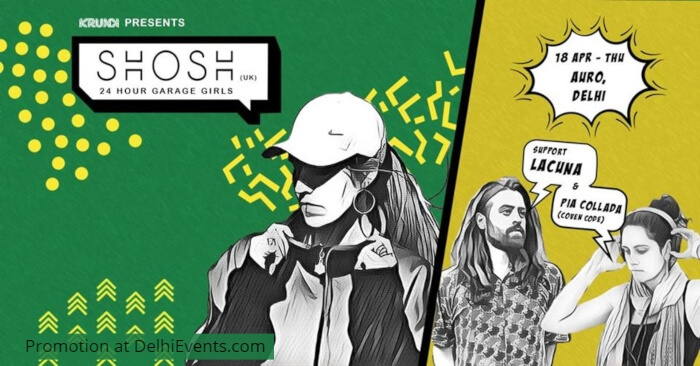 With her 1st track released on 3000Bass in 2017, Shosh has worked hard to establish her own sound, and in the last year alone, has made guest appearances at Glastonbury, Garage Nation, DJ Mag, Boomtown & Outlook Festival to showcase her music & brand. Shosh has built an exceptional reputation for her high-energy DJ sets, blending exclusive heavyweight tracks with classic old skool sounds and sing-along anthems. With a wealth of support from industry giants, and bookings every weekend throughout the UK and Europe. Lacuna is the solo experimental electronic music project of New Delhi based guitarist/producer Mihir Raina. Lacuna's sound dwells in the realm of experimental music borrowing from styles including hip hop, bass, trip hop and jungle. Pia Collada is a half India, half British DJ whose love for music comes from having grown up across India, U.S.A and Tanzania. Her sets reflect this journey, mixed with a dose of strong female energy being shared by artists from across the globe. Her mixes include Reggae, Dancehall and hip-hop mashed up Afrobeat, Afro-Trap and Afro-House music. Pia Collada has played at festivals such as Goa Sunsplash, Boxout Weekender and Bira April Fools Fest as well as events such as St.Art India, Boxout Wednesdays, Dancehall4Eva, and INCA’s women in nightlife showcase, Sisterhood Soiree. Pia Collada is part of Coven Code, New Delhi’s own femme creative collective.